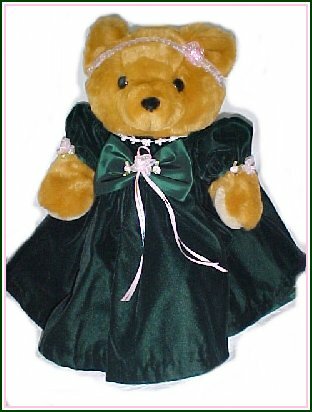 Bearonica wears a lovely designer party dress. Select her gown according to the event she'll be attending. Accessories include color coordinated headband, & personalized jewelry. Bearonica's gowns are featured in fine department stores and upscale boutiques. Bearonica can arrive wearing this.....Romantic long flowing gown in lavender and white ruffled lace. Wide, lace trimmed collar, puff and ruffled lavender sleeves. More tea and cookies, anyone? Color coordinated headband and personalized jewelry are included. We have MORE wonderful selections. The prettiest member of the AG Bear talking teddy bear family. Assorted Dress styles and colors available. 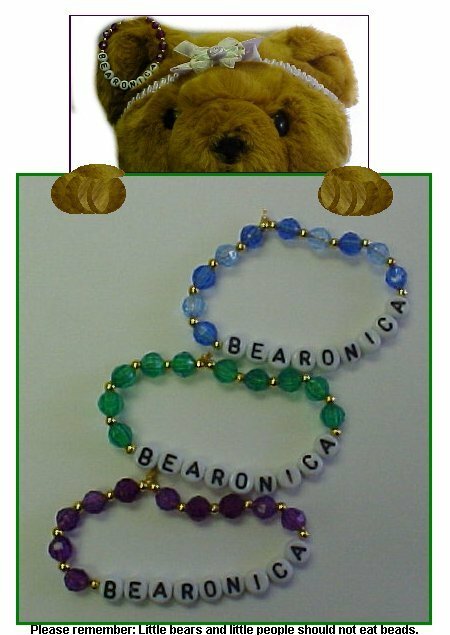 We can arrange for Bearonica to arrive directly at the home of your recipient . You are welcome to dictate a personalized gift note to arrive with her. AG Bear story CD is included.